Still less than three years old, U.S. Bank Stadium has become a favored home for some of sports’ top events and has hosted events from X Games to international soccer matches, and Super Bowl LII. 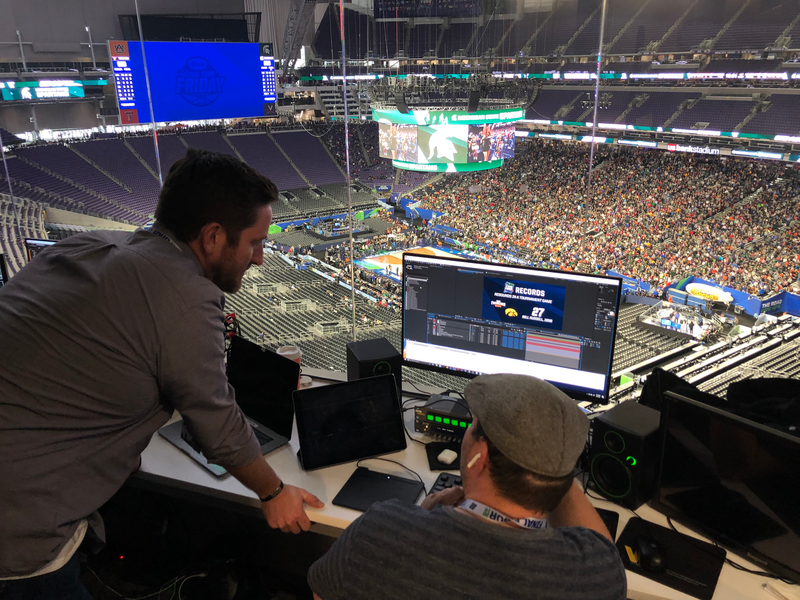 No in-venue video production, however, may rival the unique nature that has come with this year’s NCAA Men’s Basketball Final Four. 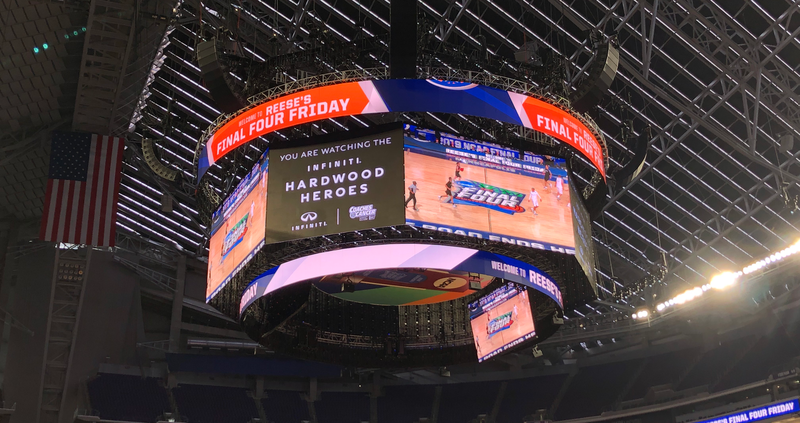 Inside Minneapolis’ U.S. Bank Stadium at the NCAA Men’s Basketball Final Four, there are three massive video fixtures to program with content, including two end-zone flat screens and a center-hung specially erected for this event. There’s already a tremendous amount of screen space to program and activate in this building with its pair of end-zone videoboards measuring a hefty 68- x 120-ft. and 50- x 88-ft., respectively. 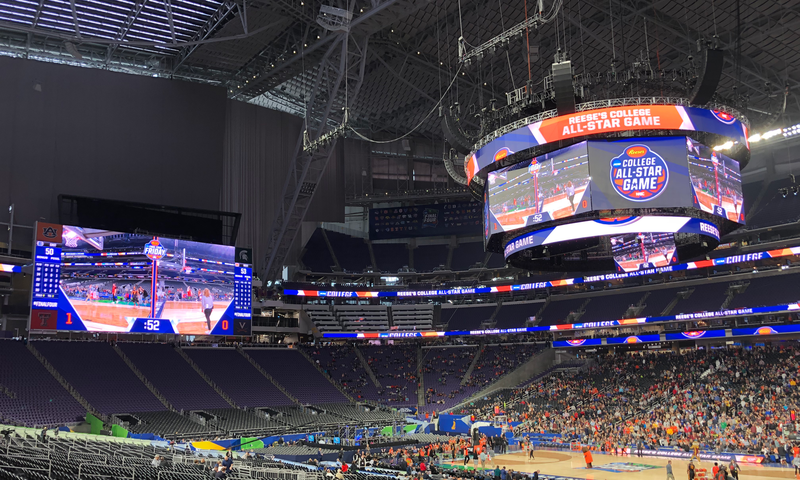 But the NCAA has added a gigantic center-hung videoboard, over the court in the center of the bowl, that completely changes the look and feel of the video aspects of the stadium. GoVision, a supplier of mobile LED units and event video screens, supplied the structure and spent a good couple of weeks to get it properly installed, safely rigged, and properly integrated with the in-house video infrastructure. And the board is proving to be the focal point during game play for the pair of Saturday semifinals and Monday’s final. In fact, according to Ryan Kehn, creative director, Van Wagner Sports & Entertainment (VWSE) — the popular group brought in to run the in-venue entertainment shows at many neutral-site championship events around the globe — use of the standard boards in the building during game play is actually forbidden so as not to serve as a distraction to the players on the court. The center-hung structure was erected and installed by GoVision, a supplier of mobile LED units and event video screens. Van Wagner has brought in some of its most talented storytellers to this Final Four, including Executive Producer Roddy White, a longtime industry veteran who is calling the shots during live entertainment. White comes with a respected history of entertaining Atlanta Falcons fans inside the old Georgia Dome. He’s joined by Senior Producer Fred Bowen, who oversees the staff in the control room and heads up coordination for highlight packages and graphics. Van Wagner Sports & Entertainment’s Ryan Kehn (left) helps build out a graphic to be used on one of the stadium’s video screens during a break in the action. In addition, as is the case at most events of this size, VWSE will call upon the people who know the host building best. In this case, that’s a robust crew from both U.S. Bank Stadium and the Minnesota Vikings, the primary tenant of the venue. They will fill all the key positions, such as camera operator, replay, and graphics. Since opening its gates in summer 2016, U.S. Bank Stadium has earned its place as one of the premier top-flight venues in the country, but it has also established itself as one of the best places for outside groups, such as VWSE and national broadcasters, to come in and do a show. You’d be hard-pressed to find anyone who doesn’t have a glowing word to say about working with the likes of VWSE’s Broadcast Operations Manager Tadd Wilson and Broadcast Operations Coordinator Justin Lange. Even Bryan Harper, VP, content and production, Minnesota Vikings has lent some members of his Vikings Entertainment Network staff. Also, in a very cool staffing note, some young production talent got the chance to be part of this show, including Anne Woody, a junior at the University of Minnesota, who earned the opportunity to serve as technical director for the in-stadium videoboard shows this weekend. As for the cameras powering the show, the in-venue crew has five cameras of its own, including roving RFs for fan-interaction shots. There are also 12 direct feeds to and from the CBS Sports/Turner Sports trucks in the production compound in the bowels of the stadium. VWSE will take some of those broadcast cameras to bolster its stock of available angles for replay. All in all, there is about 15 cameras’ worth of angles from which to build repays and packages. Combining the prepackaged content, live angles, replays, graphics, and more, VWSE is able to put together an elite show befitting an event of this scale. The real challenge lies in striking the perfect balance for the fans in the bowl. Many of the people who are working on this show work in the local environment or at least have a background there, where the goal is simple: get your home fans fired up in the most dramatic and efficient way possible. A neutral-site championship event is another thing entirely.